A state of emergency has not been canceled in the Republic of Tuva yet. The state of emergency was announced over numerous forest fire in the republic on September 4. 10 serious forest fires have not been extinguished in Tuva, as Vladimir Nedelin, deputy-chairman of the republican government, told a KNews correspondent. Forests are on fire in the remote areas, where helicopters must be used. However, local funds and finances from the reserve fund of the Russian Federation are not enough to ensure air flights to the fire areas. Tuva had already requested extra financing in the Russian Government. Due to the resignation of former Russian PM Mikhail Fradkov, the problem remains unsolved, Nedelin stated. Spirituality runs deep in the remote Russian Republic of Tyva. While Shamanism is the unofficial religion there, Lamaism, or Tibetan Buddhism, is the official one. But most people don’t have to choose between the two, since shamans and lamas don’t have a grudge against each other. Tuva is located in Southern Siberia, in one of the most isolated regions of Russia. Its people’s native religion is Shamanism – a belief in spirits inhabiting everything around them. Going to a shaman is as common for Tuvans as going to a doctor. But nowadays Tuvan shamans don’t live in woods. They drive cars, live in normal houses and even pay taxes as private entrepreneurs. It largely remains a mystery how a human voice can produce several pitches at once, but for Tuvans the art of throat singing comes naturally, picked up like a language. This vocal ability is believed to have developed from people trying to communicate with nature by mimicking its sounds. The Republic of Tuva, at the geographical centre of Asia, is one of Russia's most isolated regions nestling on the border with Mongolia. Tuvans believe that everything surrounding them – not only animals but rivers, trees and stones – is inhabited by spirits. And by learning their language, a human can capture the power of nature. Russia Close-Up: Is it time for Tuva to Exploit its Natural Beauty? 3 days running every two hours Russia Today channel aired from Tuva. The first day, September 6, was devoted to touristic and economic prospects of Tuva. Here is a story. The firstyNever mind foreigners, many Russians know little about the Republic of Tyva and don't even know where it is. There's no train service to this remote region of southern Siberia, and flights to Tyva are few and far between. Only one road connects it with the rest of Russia. Yet this secluded region is extraordinary in many respects. It's people, although poor, have an unusual culture. And their dramatic landscape is unspoilt. An emergency regime has been announced in four regions of Tuva over big forest fires, a duty officer of the republic’s forest agency told Itar-Tass on Tuesday. Over the past 24 hours the number of fire beds increased from 32 to 36 scorching big acreage of 1,900 hectares. Dry weather triggered Tuva’s forest fires in late August. 3 days starting tomorrow, September 4th till September 6th, Tuva will feature in the "Russia Close-Up" series with Ann Smith on "Russia Today" TV-channel. Every 2 hours after 10 am Tuvan time (GMT+8 daylight) till 10 pm you will be able to see the ancient palace of Por-Bazhyn and learn that it's a race against time for those excavating at the palace. 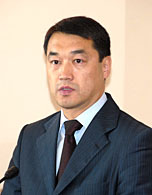 The Supreme Court of the Republic of Tuva came to a conclusion that there had been evidence of bribery in the actions of Nikolay Dubrovskiy, president of the Tyva State University, deputy of the House of Representatives of the Great Khural (Tuvan parliament).